Skilled asylum seekers who obtain protection under Australia’s humanitarian program face greater uncertainty in the job market than other migrant groups, writes Brotherhood of St Laurence Senior Research Officer, John van Kooy, in this article originally published in The Conversation. By the time I met Grace, she had been in Australia on a bridging visa for about 18-months. Part way into the interview, she reached for a stack of papers in her bag. “Let me show you something… this is from the bank,” Grace said. On her account statement, Grace showed me the recurring payments she was receiving from a non-profit agency that was disbursing basic living allowances to asylum seekers living in the community. She was receiving about $450 per fortnight. Asylum seekers living in the community on bridging visas receive a basic living allowance paid at approximately 89 per cent of the relevant Centrelink Special Benefit (usually Newstart). Grace told me that after the interview, she would be meeting with her case worker to query why her last scheduled payment — one week before Christmas — had not gone through. “So they asked me to bring a bank statement to show that I wasn’t paid, so that I’m not lying[…] It’s frustrating. I appreciate they help me, but if I can stand on my own, I wouldn’t have to go through this. I wouldn’t have to live with my friend. Meanwhile I have a debt in school — I don’t even have my certificate. It’s just… everything is bad,” she said. In 20 research interviews conducted from December 2014 to April 2015, I heard many similar stories from asylum seekers — of frustration, indebtedness, and worry. As part of a study led by the Research & Policy Centre of the Brotherhood of St Laurence, Dr Dina Bowman and I interviewed asylum seekers participating in a Brotherhood employment program. We asked questions about what it’s like to be looking for work in Australia as an asylum seeker, why a secure job is important, and what forms of support have been helpful. For people forced to migrate and seek protection under Australia’s humanitarian program, their future position in the labour market is uncertain. Humanitarian and refugee migrants typically fare worse than other migrant categories. Recent ABS data on migrants’ income levels show that even after 10 years in Australia, humanitarian migrants struggle to earn more than $20,000 per annum, well under the current national minimum wage (at full-time hours). The most recent Census data shows that only 17 per cent of humanitarian migrants were working full-time, compared with 50 per cent of skilled migrants. For migrants who are unable to find work, the longer they remain unemployed, the worse they fare in later years of settlement. OECD research has shown that getting a job early – particularly within the first six months of arrival – is critical for the ability of migrants to integrate in the longer term. Low rates of economic participation for people like Grace are taking place in the context of several competing policy objectives. While governments simultaneously try to get people “ off welfare and into work ” and grant work rights to thousands of new asylum seekers, there are limited support programs that can assist humanitarian migrants to compete in the open labour market. The passing of the Asylum Legacy Caseload Bill in late 2014 included an announcement that the immigration minister would begin granting work rights to asylum seekers living in the community on bridging visas. This led to nearly 23,000 asylum seekers being granted work rights between January and September this year. But for asylum seekers in the community, there are few employment support options. Asylum seekers on bridging visas (with or without work rights) are ineligible for government-funded employment services. Those moving to a temporary protection visa (TPV) are eligible and may have their needs assessed by Centrelink, but the level of support provided through the public system is unclear. With inadequate support and limited social networks that might connect them with potential employers, asylum seekers are unlikely to overcome the multiple, complex barriers they face in the job market. Without assistance to find work, asylum seekers develop their own explanations to make sense of why they have not succeeded. The findings from our interviews suggest the main explanations are precarious migration status, and the attitudes and recruitment practices of employers. One interviewee, Nabeel, was particularly concerned about a condition on his visa which stated that “work rights would be reviewed every three months”. Given this, how could a prospective employer be sure an asylum seeker would be able to work for any reasonable length of time, regardless of their suitability for a particular role? Perceived discrimination, and sometimes overt racism, also emerged from the interviews as possible explanations for asylum seekers’ experiences. Grace told me she had wanted to resume her previous career in accounting and finance once she had received her work rights. But in speaking to fellow migrants. “I was told that jobs here…are for the white people. So even when I go to the banks, I never see any black [bank tellers…] I would have loved to go with accounting because I’ve gone a long way, but I also saw that it’s not possible,” she said. Though not classified as “skilled migrants”, many asylum seekers do have skills and experience that have potential value in the labour market. Nabeel told me he couldn’t make use of his experience as a salesperson and accounts manager with an automotive firm. His wife — a bank clerk by trade — is also unemployed in Australia. “It’s the loss of this country. Because I am young, I can do everything. My wife is also very qualified, but she is spoiled here because we don’t have a status, as well, Immigration put a three month review [on our work rights]. We are just surviving ourselves on Centrelink money. So it’s the loss of this country,” Nabeel said. Of the asylum seekers I spoke with who were working, almost all had jobs that didn’t match their experience back home. Some had postgraduate degrees — in business management, architecture, psychology, geology, or engineering. But these pre-migration qualifications did not seem to translate into the Australian context. 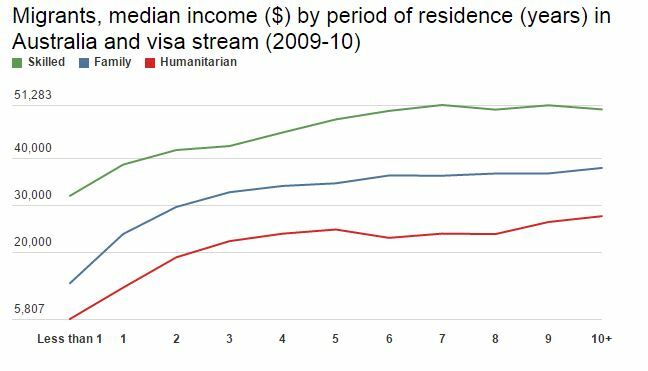 A landmark study on the economic and social contribution of humanitarian migrants to Australia by the late Graeme Hugo confirms that these groups often experience “occupational skidding” or deskilling. Previous research has shown how humanitarian migrants are often concentrated in low-skill, low-paying service sector jobs, with few opportunities for advancement. One interviewee, Isaac, described his job as a kitchen-hand as being mostly about “talking to dishes”. “I can learn [if] given a chance, not just putting on dishwashing. Dishwashing — you can’t communicate, you just communicate with dishes[…] They think of money but I need networking. Involve [us] in other things, not just dishes. How will you learn communication?” Isaac said. Various community sector organisations and past government publications have promoted the motivation and loyalty of humanitarian migrants in attempts to sway employers to consider this overlooked source of workers (with some success). Work is critical to the successful settlement and integration of humanitarian migrants in Australia. Yet there is an obvious policy gap in the lack of adequate employment support available for asylum seekers. Assisting migrants to understand and navigate the Australian job market, recognising their skills and experience, and working with employers to reduce negative perceptions and recruitment risks are all key strategies that can give asylum seekers a chance. However, relying on small community sector initiatives to fill big policy gaps is not a sustainable solution. With Australia set to accept an additional 12,000 people forcibly displaced by the conflict in Syria and Iraq, it is time to address the policy nexus between welfare, employment, and humanitarian migration. *Names have been changed to protect the identity of those interviewed. About the author: John van Kooy is a Senior Research Officer in the Research & Policy Centre at the Brotherhood of St Laurence and currently undertaking a PhD at RMIT University on the economic survival strategies of newly-arrived refugees and asylum seekers in Australia.